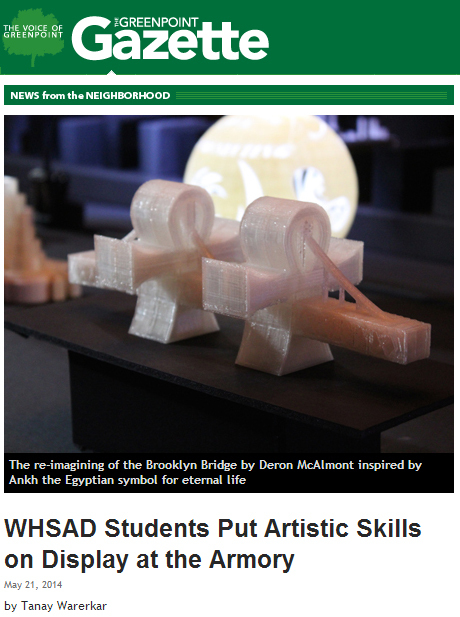 On Monday, May 19th, the Park Avenue Armory opened its doors to the public to showcase the talent of the students of Williamsburg High School for Architecture and Design. The freshman class showcased their architectural drafts and AutoCAD designs. The sophomore class showcased their ability to design floor plans and models on AutoCAD. Sophomores in Ms. Pickering’s English class also displayed their lyrical talents as they read their original poems out loud. The seniors in Mr. Codio’s architecture classes displayed their Advanced AutoCAD designs as they were printed in three dimensions. In collaboration with the Artist in Residence program, English teacher Mr. Rodriguez, Architecture teachers Ms. Moos and Mr. O’Brien, and Photography teacher Dr. Wiprovnick highlighted the work of WHSAD’s eleventh graders around the Armory’s upcoming showing of Shakepeare’s Macbeth starring Kenneth Branagh. Mr. Rodriguez’s students reinterpreted the Scottish play in a series of modern settings, with props designed in Ms. Moos and Mr. O’Brien’s classes. Furthermore, students in Dr. Wiprovnick’s class re-told the Scottish play through a photographic essay from pictures they have taken from the junior trip to Washington, D.C.
To see photographs taken by Dr. Wiprovnick and eleventh grader Darah Hutchison, click here.